T3 Voluminous Hot Roller Set gives gorgeous curls a la Veronica Lake. Not only do these heat up in a mere three minutes but they are made with tourmaline technology so they are gentle on the hair and give great shine. 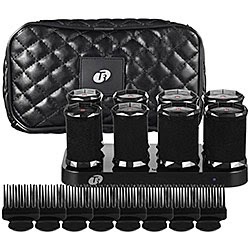 If you think curlers are old fashioned think again - this set is extremely popular. Also included are some styling instructions and additional techniques are on their YouTube channel youtube.com/t3micro. Clairsonic Pedi Foot Transformation Set gives celebrity soft feet. The sonic technology takes dry, cracked, calloused feet and transforms them into flawlessly smooth skin. This limited edition set includes all the accompanying products to give you the feet you so desire. There is a cleansing scrub, a deep penetrating moisturizer, an essential foot peel made of glycolic acid, a buffing brush and a smoothing disk. What more could a girl ask for?! You might want to move fast on this though, they are selling like hotcakes. 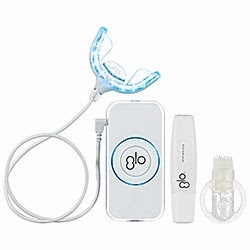 GLO Brilliant Teeth Whitening Device is one of the most advanced ways of brightening your teeth at home. It combines white optic technology (a lighted mouthpiece) and a peroxide gel to give optimum results with little to no sensitivity. It is a simple to use system that can brighten your teeth 5-8 shades. And you only need to use it twice a year! That's what I call low maintenance. Buy an extra mouth piece and more than one person can get use out of it. Bliss Trim and Bare It is a girl's best friend. This at-home shaver comes with a variety of styling heads to meet a variety of needs. 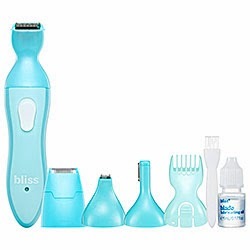 There is the facial trimmer, the precision trimmer for a ultra close shave in tight spots, and the basic bikini groomer that is recommended to use in between professional waxes to keep things nice and tidy. 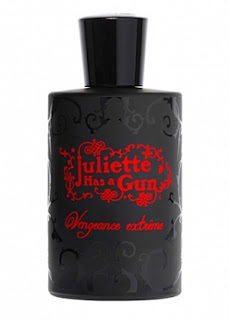 But I'll let you in on a little secret: for those of us who are wax-phobic you can (carefully!) use the trimmer without any of it's attachments to get something that fairly resembles a wax job. Yes, even a Brazilian.